Name: Western’s Homecoming Chili Cook-Off! Put your chili to the test and cheer on the Mustangs February 2nd, 2019 at Western’s Homecoming Chili Cook-Off. 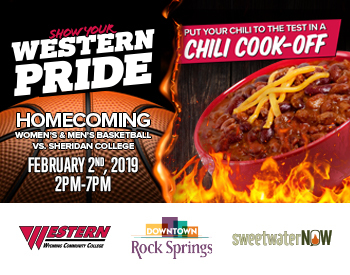 Western Wyoming Community College teams up with Downtown Rock Springs February 2nd, 2019 from 10:30AM-1:30PM in a Chili Cook-Off. Individuals and businesses from Sweetwater County are invited to submit either red or green chili to win cash prizes. The February 2nd festivities are an opportunity for community members to stroll around Downtown and check out Rock Springs’s local businesses, learn about Western’s programs, and sample home-made chili. Many of Western’s program departments will set up shop in these businesses or Bunning Hall during the event, giving community members a chance to talk with faculty and see what types of career options are available to graduates. Chili Cook-Off registration is free - both businesses and individuals from Sweetwater County are invited to submit red or green chili to the competition. Space is limited - first come, first serve! Chili Cook-Off winners for both types of chili will receive prizes of $500 for first place, $250 for second place, and $150 for third place. To register a batch of chili, email Audrey Harton, Western’s Public Relations Specialist at aharton@westernwyoming.edu. The individuals attending the Homecoming celebrations are encouraged to sample chili at each location and get their raffle card stamped. Raffle winners will receive flights from Southwest Wyoming Regional Airport as well as gifts donated from Downtown Rock Springs. All winners will be announced at the women’s and men’s Mustang Basketball games in the Rushmore Gym on February 2nd from 2PM-7PM (must be present to win). In addition to the Chili Cook-Off, Thunder, Western’s mascot, will be around greeting the attendees and the children at the face painting table. There will be student games, burn barrels for s’more roasting, and more. Western’s co-sponsors of this event are Downtown Rock Springs and SweetwaterNOW, and are supported through private donations. Free and open to the public! The community is invited to attend and bring family and friends.